In 2011, Google, after unsuccessfully launching their first social network, took a second stab at building a network to compete with the likes of Twitter and Facebook. This was of course, Google+. 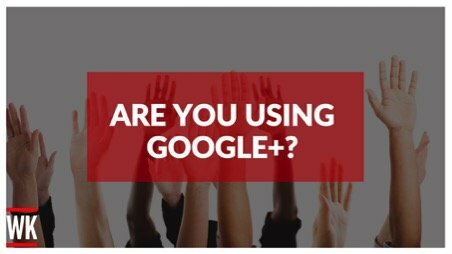 In my opinion, Google+ is often overlooked by many businesses in the social media world, even though it has been quoted as the secondÂ biggest social network. Offering images, videos, content communities and much more, Google+ stands side by side some of the longer running networks offering the same range of features. When I deliver a presentation at an event or trade show about social media, I always ask the room to raise their hand if they have a Google+ business account and I am lucky if 40% of the room put their hand in the air. This needs to change for so many reasons but one in particular; YOU can win new business on Google+ and here is how. This may seem quite basic and obvious, but so many businesses donâ€™t complete their profile to get the 100% completion. It is extremely important that you have a cover photo, profile picture, business information, website links and other pieces of information to get your profile 100% completed. If you customer is satisfied with the product/service they have received from your business, as them to leave a review on your Google+ page. Whilst this may seem difficult for the less tech-savvy customers, it will be worth the time getting that review as this will be one of the first things a customer will see when searching your business inside of Google. Google+ circles allows you to bring together a group of people so that you can send out specific information, suitable to that group of people. If you have a community broken down into different groups based on their connection to your business, it allows you to target each group with different pieces of content, knowing it will get engagement. Google+ Hangouts is a video chat service that you can use for Q&A sessions, workshops, announcements, webinars and more. If you have something important to say, organise a Google+ hangout to gain exposure for your business. This can help build your profile as a industry leader. As you may know from reading my content, I talk a lot about automating your social media activity to help save time. You can use Hootsuite to schedule your Google+ posts, at the same time as your Facebook, LinkedIn and Twitter updates. An alternative, if you donâ€™t want to use Hootsuite is to use a tool I recently discovered as a Chrome plugin called DoShare plugin. This allows you to share content at a time that suits your audience. When you find content you want to share with your Google+ community, click the DoShare icon in your browser, and it will automatically add it to your queue of content to be sent out at an optimum time of day. Every social network has their own image dimensions and when it comes to Google+, you need to understand that images are tall, and skinny to capture the attention of your audience. Whilst this isnâ€™t a necessity, if you have something important to share online, make sure you consider trying a different shape visual. A great tool to help you do this is Canva. I am a huge advocate of Canva as you can create professional looking images at no cost. Take a look at Canva here, and create some great visuals for Google+ and other social networks you are using for your business. It is important to remember that Google+ can help you win new business, as it has with me. As I am an avid Google+ user, I make sure that for certain Google searches, my Google+ posts are visible on the first page of Google. 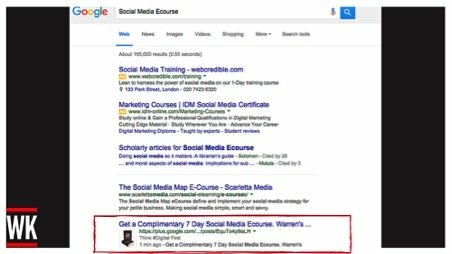 As you can see below, I am on the first page of Google for searches on â€œSocial Media Ecourseâ€. I have had clients search this on Google, come through to my Google+ account, click on the link, sign up to my complimentary ecourse and then become a paying client after going through this online journey of trust. Making sure you have a complete profile, nice visuals, consistent content and engaging with your audience will give you the best chance at winning new business from Google+.